Check out the summer cruise schedule under Club Cruises. Kevin and Frederique O’Keeffe are coordinating our summer cruise — watch for emails from them, or simply send them your ideas. I’ve also started a new feature under Club Cruises, called “Favorite Harbors” — write up a description of your favorite harbor, send it to me, and I’ll post it! New calendar and race dates posted to the RYC site. Rockland, ME. — Rockland Yacht Club (RYC) will hold an Open House and concurrent Nautical Flea Market on Saturday, June 14, 2014 at the RYC clubhouse, located at the Public Landing (center harbor), Rockland. Open to the general public (9AM—2PM), this event will be staffed by RYC Members and refreshments will be provided. Unlimited use of the RYC Launch operating from the Public Landing, providing drop-off and pick-up services from most popular marinas and restaurants during season—June to mid-September. With proceeds benefitting RYC programs, gently used and new nautical gear will be available for purchase by anyone attending. Nautical items offered are expected to include: rigging, marine instruments, shackles, blocks, cleats & fasteners, dinghies, books, etc. The RYC clubhouse will be open for Flea Market donations on June 13th. Clothing samples featuring the RYC logo will also be on display and available for purchase. RYC is an enthusiastic, community minded yacht club intent on preserving and growing the boating presence on beautiful Penobscot Bay. 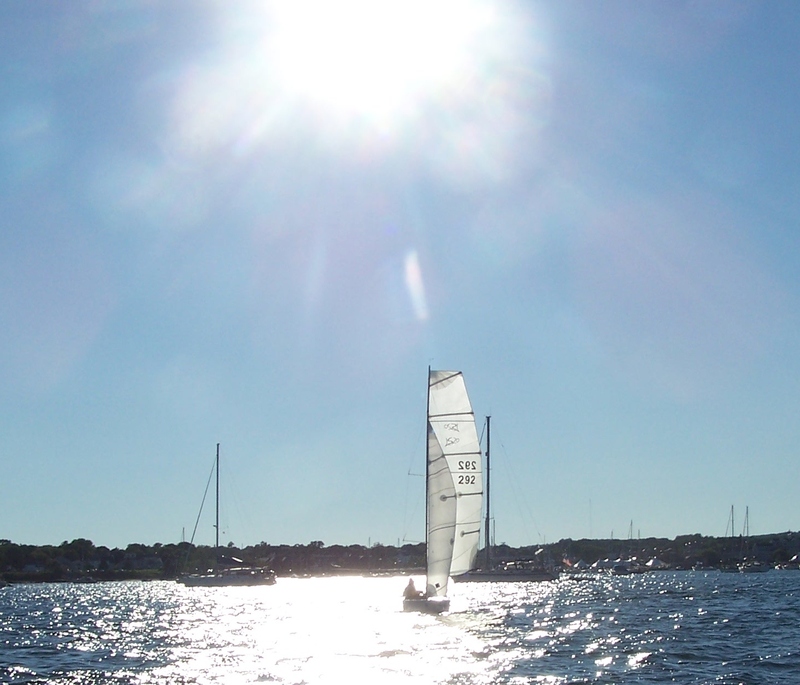 The RYC was founded in 1927 as a community yacht club supporting activities in the Rockland area. Presently there are about one hundred seventy-five members representing about eighty boats. The club sees itself as a relaxed, informal group of boaters. The weather was pretty bad Friday night and Saturday morning. I was ready to give up on the Icebreaker Cruise. Jim Easton suggested we delay until noon when the weather was expected to improve. Well it wasn’t great, but the rain stopped, the wind let up a little and the seas settled down a little bit. Intuito and Spirits headed across to Fox Island Thoroughfare with just the jibs flying. It was kind of bumpy, but we made good time. Seal Bay was empty and the skies cleared up by the time we got there. We had snacks aboard Intuito then went to shore for a walk. Well it was more like bushwacking, but it was interesting. After supper, Jim and Melissa came over to Spirits for dessert — strawberry shortcake. We had a nice quiet, calm night; quite the opposite of Friday night in Rockland Harbor. Spirits got going early on Sunday to get back in time to see the Canadian Grand Prix on TV. Intuito was more patient and waited for the skies to improve and the winds to pick up. Thanks Jim and Melissa for a successful, enjoyable cruise. We’re all looking forward to the 4th of July cruise now. We got a preview of the 4th of July on Sunday night, watching fireworks which were being sent up from Samoset. Now I am no economist, but I have been watching the sign that Knight Marine has up on Main Street advertising the price of lobster on their dock in the North end going down and down and down, so I might be way off base here, but… it seems to make no sense for our fleet on Tuesday nights to try and pull lobster pots while they are racing! Maybe the low price forces the diesel powered lobster boats to stay on the moorings and so using a sailboat is the way to go, but what do I know!? I will tell you what I know… I know that there were 12 boats out this Tuesday having a lot of fun on yet another beautiful night. We have to take them when we get them! Wow! are we having a great season with the post race Side Dish BBQ Results gatherings! aren’t they great?!! Yes they are, which brings me to my next point…… Special thanks to Aaron, (his parents) his lovely wife Coretta, and Robert and Bob for all their work on our behalf, setting up a great friendly fun place for us all to gather post each race…. OK I have a small idea…… let us realize for just a moment that Aaron and those that he has to help are just doing this out of their good graces… so lets MAKE SURE that we help set up, clean up, clean our places when we leave, and continue to help with $$$$ stuffed into the jar…. everyone getting the hint? Thanks much…. 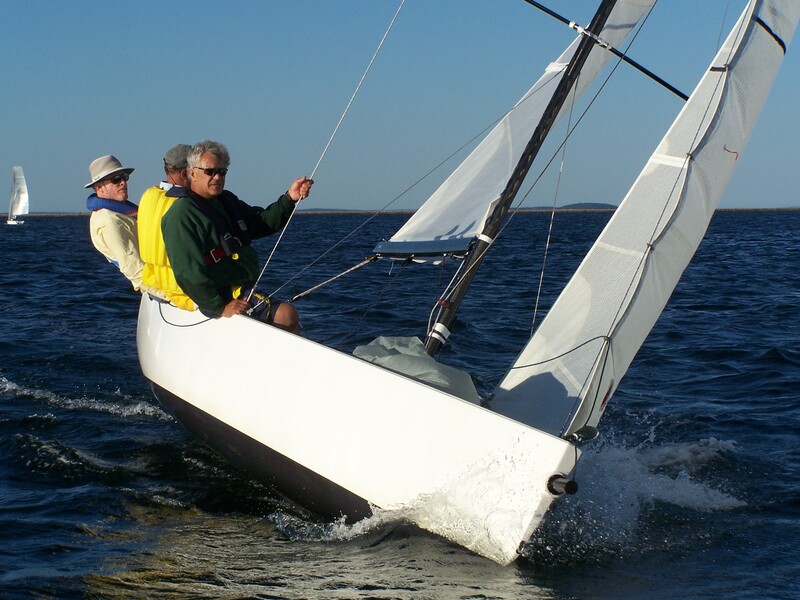 The LS-20’s continue to look good out on the course, Special thanks to Hannah and Bay Sailing for making this work! Want to try one out? Click the blue link in the sentence before this one! Ok so that is it for now, other than to say I will see you all this Thursday for the World’s Longest Named Regatta: That’s right The “The Second Annual Rockland Yacht Club-Rockland Community Sailing Scholarship Keelboat Regatta” is scheduled for this Thursday, (tomorrow) see you there. The week cruise got under way right on time Sat. Aug. 4th. The first stop was Belfast. The boats making it to Belfast were Altair, Maura;’s Myst, Koan, Liberty, Sea Monkey, Intuito UNC IV, Spiritrs and Charis (they were there with the Hunter Owner’s Club). There was an art show taking place which folks enjoyed browsing. Most of the crews got together at Three Tides Brew Pub for a drink and conversation. Sunday was foggy and breezy. It was a very lively sail across to Holbrook Island. Altair left us Sunday, but we were joined by Summer Salt and Snowy Owl. Most folks chose to hike in the Holbrook Sanctuary for the afternoon, but Dave and Linda Souer of Liberty explored Castine, as did Elaine and Dutch Dresser on Koan who stayed over near Castine. Social hour was aboard Spirits. We enjoyed seeing the eagles and ospreys near the anchorage at Indian Bar. A large yawl came into the harbor in the evening and went aground. Don and Jody Abbott from Snowy Owl checked on them and found them alright. The crew of the yawl waited for the tide to come in enough to refloat them and they re-anchored near Ram Island. There were some very gusty winds and heavy showers during the night, but everyone did just fine. By Monday morning the skies had cleared nicely. We headed out the south channel by Holbrook Island and found very nice wind out on the bay. We had some excellent sailing up to Cape Rosier, but after rounding the cape the wind died off and remained light for the rest of the trip through Eggemoggin Reach. Snowy Owl left us as we turned the corner and they continued down the bay. Persephone joined us at the entrance to Eggemoggin Reach. They had stayed at Pickering Island. The boats sailed wing and wing most of the way through the reach. Sea Monkey and Intuito were able to fly their spinnaker and gennaker respectively. Webfoot joined us at Buckle Harbor There were large schools of 3-4″ fish when we arrived in Buckle Harbor. The gulls and terns were feasting on the fish. Some brave souls such as Melissa and Elizabeth from Intuito and Gerritt from Persephone went for a swim in the cold water. People enjoyed exploring Buckle Island and as has become the custom, our social hour was on the beach and rocks on the tip of the island. The crew of Athena, a boat from Belfast, joined us there. Bob and Stephanie are very accomplished sailors. They decided to come along with us to Little Cranberry Island Tuesday. Tuesday morning was calm and clear. Jennie from Spirits put up the muffin flag and a big crowd came over with their tea and coffee and enjoyed freshly made muffins. Fresh blueberries for the muffins were supplied by Kay and Tom McKenna of UNC IV. The wind remained light and we did a lot of motoring. The exception was Koan. Dutch was determined to sail. At Little Cranberry Island people did their own thing. Some went to lunch at the dock or ice cream at the snack truck, some went to the museum and some walked around exploring the island. Many did a combination of the above. In the evening a large group went to the restaurant for dinner and another large group went over to Summer Salt for dinner. As for the crew of Spirits, Jennie, Steve, Thomas and Adrian had a delicious spaghetti dinner aboard. Wednesday was very still and a bit foggy. The fog quickly thickened until it was hard to see more than a boat or two away in the mooring field. There was not much enthusiasm amongst the cruisers to go over to Flanders Bay. Gerritt and Toni Vander Veer suggested going up Somes Sound to Somes Harbor where they promised there was some warm water to swim in. That sounded good and the other cruisers agreed. We had light wind over the stern for the sail up the sound so it was a bit slow, but we didn’t have to go far so that was okay. Webfoot, UNC IV, Athena and Koan headed off on their own, so at Somes Harbor we had Intuito, Spirits, Sea Monkey, L:iberty, Persephone and Summer Salt. Persephone took on an extra crew member for the day – Adrian from Spirits. A number of us did go swimming. I wouldn’t call the water exactly warm, but it was very refreshing and not numbing like much of the ocean in Maine. There is a gas station/convenience store about a half a mile from the anchorage so several cruisers took adbantage of the chance to get a few supplies. All in all it was a very relaxing day. Thursday can you believe it was foggy again? It cleared fairly early. Persephone and Liberty headed out very early as they were going to try to reach Vinalhaven by the end of the day. The rest of us left a little later and tacked in light wind back out of Somes Sound. We all stopped at Southwest Harbor; Intuito, Summer Salt and Sea Monkey just for lunch, but Spirits stayed there on a Hinckly Boat Yard mooring for the night. We were therefore able to walk around town in the afternoon and go out for dinner in the evening. The other three boats continued on to Laundry Cove at Isle Au Haut. Friday morning was very foggy and still. Does that sound familiar? We left Southwest Harbor as the fog lifted some and a breeze started up. The fog stayed with us for the day sometimes thinner, sometimes thicker. The wind too was fickle. We were able to sail most of the way, but sometimes it got too light and we would start the engine only to have it pick up again 5-10 minutes later and we would go back to sailing. As we emerged from Merchant Row into East Penobscot Bay, Intuito, Summer Salt and Sea Monkey were just coming out of Laundry Cove. They followed us to Seal Bay, except for Summer Salt whose crew decided to continue on to Rockland. An hour or two after arriving in Seal Bay we were pleasantly surprised to see Randy and Mary Mraz on Emme come into the anchorage. They and their two guests were returning from attending the music festival at Swans Island. It was a rainy and windy night. Saturday morining, however, it was calm and you guessed it, very foggy. It was a motor all the way back to Rockland except for Intuito’s crew who attempted to sail for part of the way. Intuito, Spirits and Sea Monkey came by the breakwater lighthouse together to complete another successful RYC cruise. 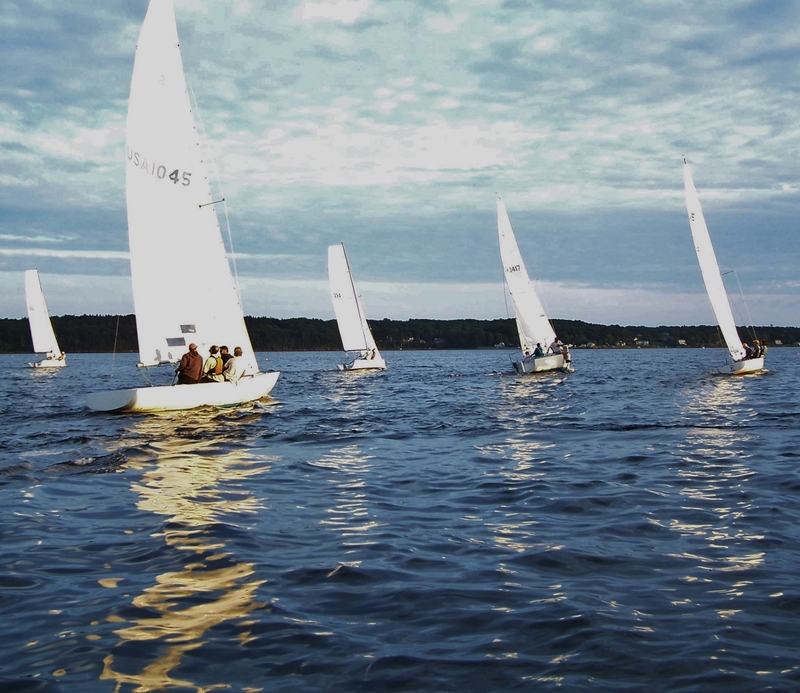 Rain, thunderstorms, cell phone radar and lack of wind got the best of the Tuesday night racing fleet this past Tuesday. Half the group decided not to race and headed home early. A few boats were already out however and wondered where the fleet was.. Well I guess we made the wrong call, because by 5:30 or 6 a little breeze came in and the ‘second line of thunderstorms” did not appear. Spotted out on the water ready to race this week was a bright yellow Pearson 30 called (aptly) Chiquita… we are sorry we did not have a fleet for them to race with, but we will next week… that’s for sure! Also Thanks to “This Guy”, Wyanokee, and Seaglass for also coming out. All was not completely lost last night however as the boats that were out ended up enjoying a wonderful evening of sailing around the harbor and one of the LS-20’s snuck out on a test sail. Take a look below, recognize anyone?